Japanese Episode DP 013: "Good Luck Mukkuru!" American Episode 477: "A Staravia Is Born!" Satoshi is in the woods training his Mukkuru for his upcoming Gym Battle in Kurogane City. As the pokemon attempts to learn Aerial Ace, it accidentally crashes and hurts its leg! After Takeshi applies some medicine, a young bird watcher named Yukari stumbles onto Satoshi-tachi's campsite. She tells the trainers that the number of bird pokemon in the region are rapidly declining, so Satoshi and the others decide to help her figure out the reason why. As Mukkuru flies around for clues, it is caught in a net and dumped into a cage with all the other bird pokemon! The net was put up by none other than the Rocket-Dan to capture all the flying pokemon in the area to give to their boss! Satoshi starts to become worried when his Mukkuru doesn't return, so he and his friends head into the forest. 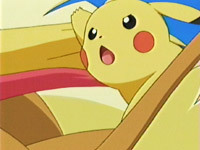 They eventually come across the net and the Rocket's Secret Base, so Satoshi sends his Pikachu off with a wild Pigeot to get help from the remaining bird pokemon in the forest. While it's doing that, Satoshi and the others sneak into the Secret Base to rescue the bird pokemon. However, when they arrive, they find that Mukkuru, with the help of a captured Hoho, has already done all the rescuing for them! The Rocket-Dan finally realize what's going on and activate their giant mecha to combat the trainers, but Pikachu and the forest's bird pokemon join forces to bring the robot down. The battle continues on land, so Takeshi sends out his Usohachi to battle! After the bonsai pokemon learns Mimic attack, Satoshi's Mukkuru flies into the sky and evolves into Mukubird! Mukubird swoops down on the trio and sends them blasting off with an Aerial Ace, saving the pokemon! After Yukari thanks him for helping her out, Satoshi and his new Mukubird continue on the path to Kurogane City. Well well well...an episode like this is rare, isn't it? We get a Rocket-Dan scheme that's frighteningly decent. We get wild pokemon (in the case of this episode, Hoho) who actually resist being captured. We get an evolution for Satoshi's pokemon. We get a new attack for one of Takeshi's pokemon. We get foreshadowing to a future evolution of said pokemon. We get to see Takeshi's eyes. Really, there isn't anything I can find wrong with this episode. Well, Yukari's role is pretty expendable, but for some reason that doesn't bother me as much as it normally would. Maybe it's the fact that she has a Poketch, an item that we won't see too much more often? The dubbed version actually keeps a whopping six pieces of music, including an instrumental of Lovely Boy (aka the one piece of background music that got replaced in Destiny Deoxys). That's the most we've had in a long while, and while it's still far from what I'd like to see, it's still a step in the right direction. As far as the character-of-the-day goes, it seems like the VA couldn't decide if they wanted to go for an Australian accent or just a really crappy English accent. Either way, it sounds pretty bad. It also doesn't help that she was given one of the most random names PUSA could have come up with. I mean...Rosebay? Really? While it's not on the same level as Roark or the majority of the names in the GameCube RPG's, it's still pretty scraping-the-bottom-of-the-barrel-y for my tastes. Hoho, Dodrio, Tyltto, and Nati keep their Japanese voices. "Oi, they done put t'ree seconds onto the end o' this 'ere episode. Bloody oath! Now if me mum had been in charge (she's a legend! ), them extra seconds woulda got the sack. Meat pies! Gordon Brown! Anzac day! Hollyoaks! AFL!" Thank you, Rosebay, and your pseudo Australian slash English accent.